At the Department of “Natural Sciences and Mathematics” in the International Medical Faculty a student scientific-practical conference was held within the framework of the science of the week “Natural Science and Medicine” dedicated to the year of development of regions in the Kyrgyz Republic. 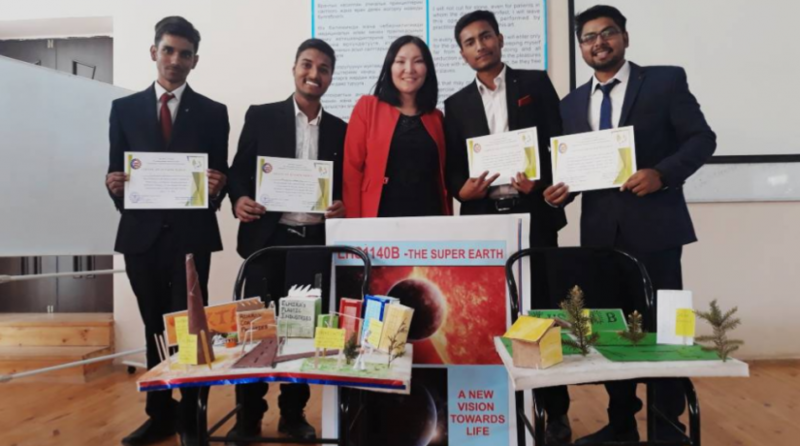 The conference was attended by students of 1-2 courses on the subject of chemistry, biology, biochemistry, physics and mathematics. The students prepared slides and models for their subjects. They actively participated with their presentations and presentations. After the discussion with the participation of teachers and students and in accordance with the number of points scored, the winners were: I place: student: Ranjan Prasad, Kushwaha Rahul: 1eng- 20B. Issued a certificate of I degree II place: student: Ataur Rehman: 2eng- 3B. The certificate of the II degree was issued. III place: student: Hemant Sharma, Saurav Kumar: 1eng- 20B. The certificate of the III degree was issued. IV Place: student: Abdul Rezza: 1eng- 5B. The certificate of the IV degree was issued. The rest of the participants were given certificates for active participation in the conference. The winners of the "Journey to the novels of Ch. Aitmatov "